Looking good for the sow? 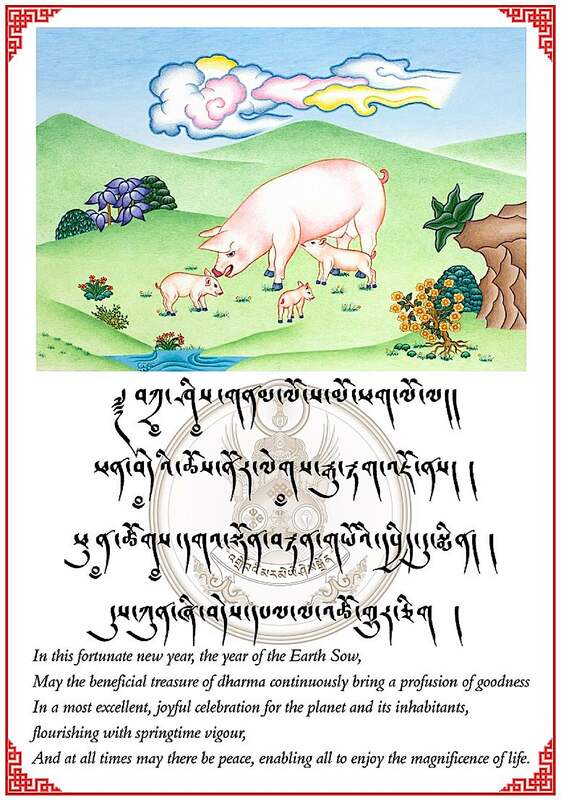 We could all use a little good fortune and happiness, and I don’t think anyone would disagree that we universally hope the Year of the Earth Sow (Earth Female Pig 2019) will be much better than the outgoing Earth Dog (2018). 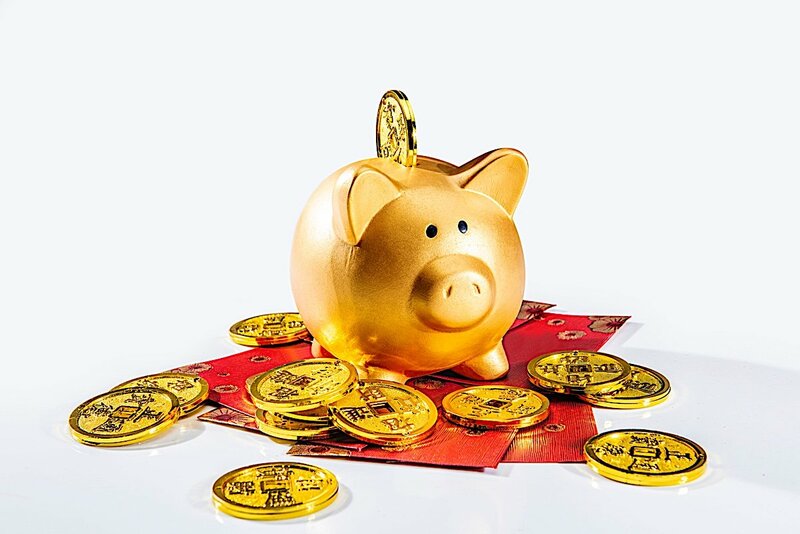 The Earth Pig year, which begins on February 5, 2019, this year, —In astrology, typically, Earth Dog is a bad year, for example, for natural disasters and weather. 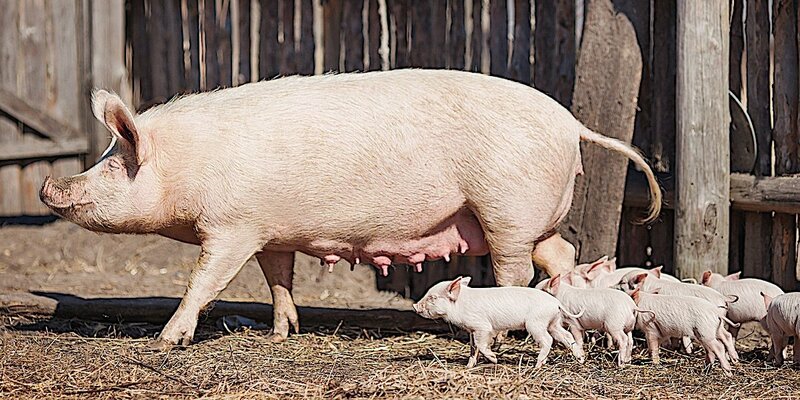 2019 is the Earth Sow year (Female pig, rather than the boar) — a year normally of prosperity and growth associated with the land and farms. It’s a good idea not to eat pork, at least for the first 15 days of the year, preferrably not at all. According to astrology, most forecasts are much more positive. Earth dog is yang energy and unsettled. 2019, on the other hand is Yin Earth. Astrologically, whether it’s lucky for you or not depends on the year you were born in. Generally, it’s not a good year for the people of the same animal sign. Earth Pigs and Pigs generally might not do well. 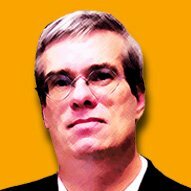 But, for many of the rest of us, it seems to be forecast to be better year than 2018 in many ways. Rat – A prosperous year full of happiness and many new opportunities especially those born in 1960! Ox – A great year for Ox and a perfect year for new prospects to make money or change career. Tiger – A mixed year and normally you are not fazed by events although this year you will probably find you will need to adjust and be more considerate to others. According to traditional lunar astology, the Earth Sow year is generally a prosperous year — but not, as always, without challenges. Rabbit – A good and exciting year in 2019! Dragon – A mixed year although with placing all your annual Feng Shui cures and enhancers all will be well. Dog – You will have to put some effort in this year but following our advice, you will do well. 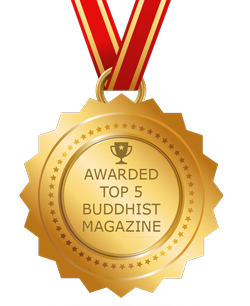 Whether you believe in astrology or not, Buddhist tradition generally holds that the first 15 days of the New Year are the most important — and most especially February 5, the first day of the year. The merits of practice and karma are “multiplied” according to many sutras and tantras and teachers. 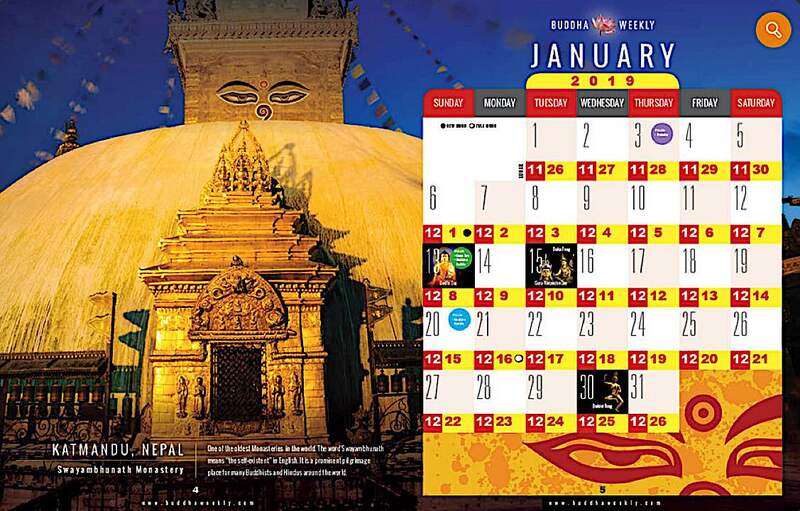 A must-do: check with your local Buddhist centres for Losar events to bring in the New Year right. A beautiful Losar card from Kagyu Samyel. Planning ahead, for practice celebrations, can help us get a good start to the Lunar New Year. 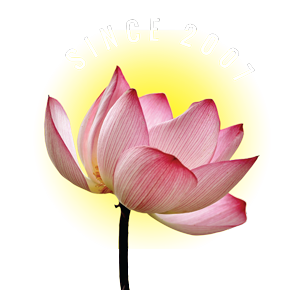 It’s the best time to plan a working mantra retreat, for example — imagine those 100,000 mantras multiplied! You don’t have to literally believe in the “multiplication of merit” tradition to understand that a good start to the New Year can set the tone for the next 360 days. [Lunar New Year is 12 months of 30 days.] Plan for extra elaborate offerings on your home altar. Try out, if you’re not already a vegetarian, the ancient tradition of only eating vegetarian on the first day (or at least the first meal) of the year. Prior to New Year, there is often a traditional dance designed to “scare away” the demons, spirits, ghosts. Whether you believe in astrology — choose your colour, Purple King, various Tibetan astrology systems, or Western astrology — it can be fun, and almost irresistible, to see what’s “in store” for us. If it’s not so good, we can shrug and say, “Oh, I don’t believe in that stuff”; but if it’s good, we can hope for the best. The meritorious deeds you might contemplate are simply good karma and compassionate activities, so there’s no reason not to engage in at least some. 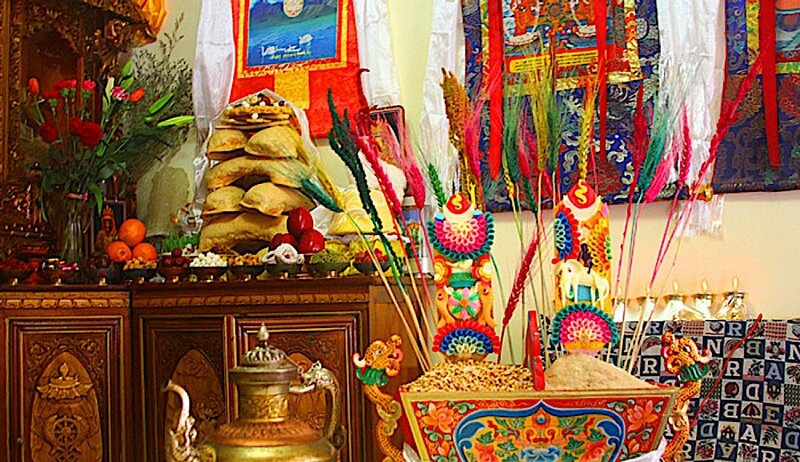 Offerings and purification are important prior to Losar, to ensure you don’t carry any negativity into the new year. Then, of course, after New Year, offerings are super important — the merit is multiplied. 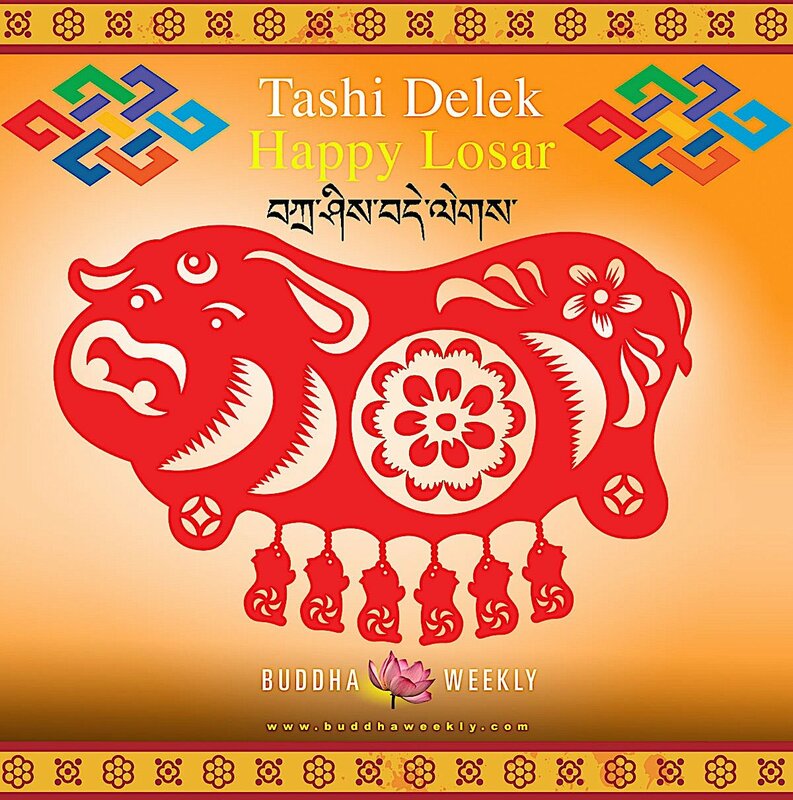 In Buddhist areas that celebrate Losar, preparations begin a month ahead. One beautiful activity is to plant seedlings in flower pots — so that by the time Feb 5 rolls around, you have lovely little seedlings (usually barley, but whatever you have: flowers are nice) to offer to the Buddha, Dharma and Sangha — the Three Jewels. Traditionally — and psychologically this makes sense too! — we don’t bring negativities into the New Year. Settle or put aside law suits, settle arguments, ask for forgiveness (before New Year. Some people throw away old clothes. If you plan on haircuts do it before the New Year, since tradition holds that it’s best not to shave for at least a couple days into the New Year. Renovations and major cleaning should be undertaken before the new year, and should at least stop for the first 15 days of the New Year; they disrupt the chi of your home. 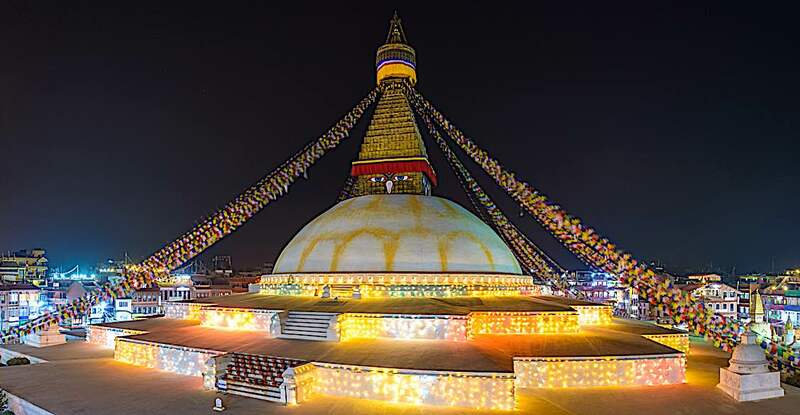 Losar in Nepal is brilliantly lit up at the Boudanath Stupa Kathmandu. Lots of light brings in brightness for the New Year. A major house-cleaning. The kitchen is the most important, as it’s the “family” centre, where food is prepared. Volunteering for karma-yoga at your local gompa or temple to help clean. Decorations are good to cheer up the home and temple with lighting and festive color, including, if you have them, mantra rolls and flags. During New Year, there will be traditional dances and celebrations — which may vary based on the area of the world. Vajrasattva practice prior to New Year is important for serious practitioners to eliminate negativities and bad karmas prior to Losar. Unlike western New Year’s Eve, which is a great big party, for Lunar New Year usually the evening before is dedicated to “getting rid of the nasty old business.” There are plenty of cool traditions, most notably purification. 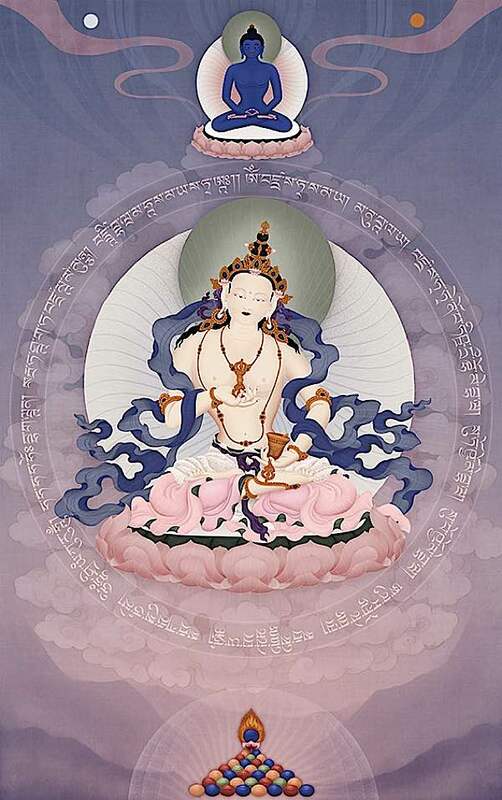 Your teacher might recommend sessions of Vajrasattva practice, or 35 Buddhas practice, or your Yidam practice to purify negative karmas before the New Year. Other traditions include things such as family dinner of traditional dumpling soup — into which the hosts place white pebbles, hot chillies, etc. into the soup. Whatever you find in your dumpling means something. Chili, for example, means you’re too talkative. Salt or rice in the dumpling is auspicious. A stone means to loosen up that “hard heart.” This is a local custom and caution in eating dumplings with stones is warranted. 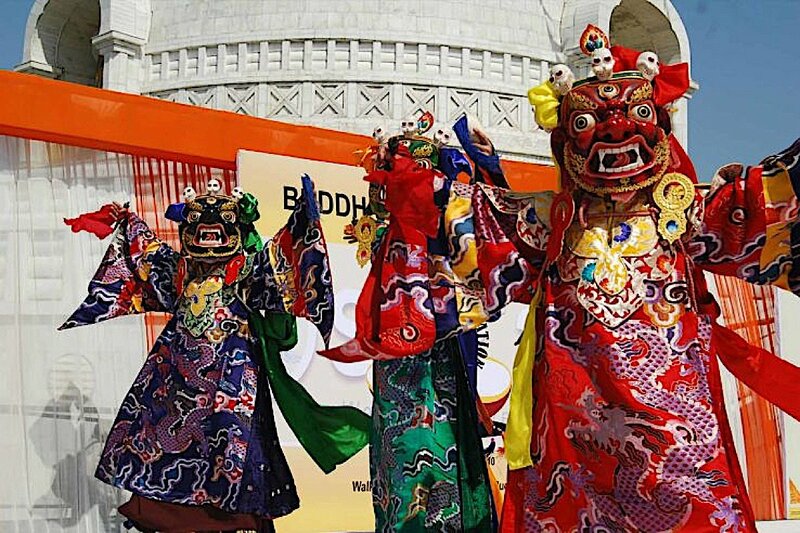 The other traditional activities are the dances to chase away evil spirits, ghosts, demons and inner demons — and negative karma. In the house, this might include carrying a torch — today, for fire safety, probably a bunch of sage or herbs as a purifying incense — to “chase away” these evil spirits. Usually, you shout out “Get out! Get out!” You then, ideally take the torch or bunch of sage to a crossroads — in areas where this is popular, many road crossings are simply smouldering. Other similar traditions include a parade or procession of people carrying food for ghosts — hungry ghosts like treats — luring them to a big campfire, then throwing the food into the campfire. The food becomes “edible” for the ghosts — and meanwhile, they’re out of your house. Ideally, colourful clothing ushers in the New Year. It is traditional to offer to the Buddhas, Dakinis, Protectors before eating. In most areas, it would be traditional to exchange Katas (white scarves). Especially, for at least the first two days, be mindful of all language, especially no profanity. Avoid saying words out loud that are negative, like “kill”, “butcher”, “sick”, and so on. 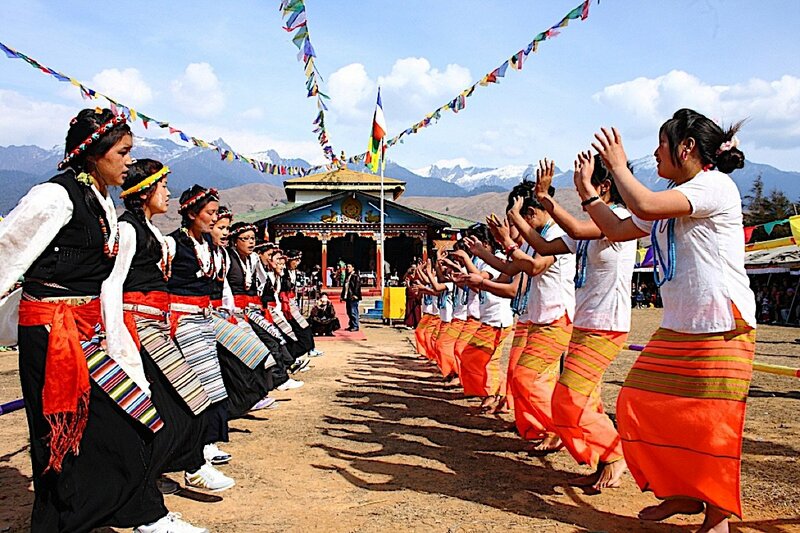 Above all, on Losar, have FUN and don’t bring the negativity into the new year. In most areas (Chinese New Year included) it’s traditional to wear new clothes on the first day. Traditions differ on bathing. In some traditions, you bathe on the first day to make sure you start clean, but in others, they clean the day before and try not to bathe on the first day — it “washes away the luck.” But these are symbolic acts, so whatever resonates is best. Offerings, in the form of tormas, are important. Any spiritual activities are beneficial. Offerings to the teacher or Guru, to the Buddha and Three Jewels, are important for “merit”, but also to give thanks for a New Year of opportunity. Traditionally, altars with offerings for the Enlightened Ones should be laden and generous. 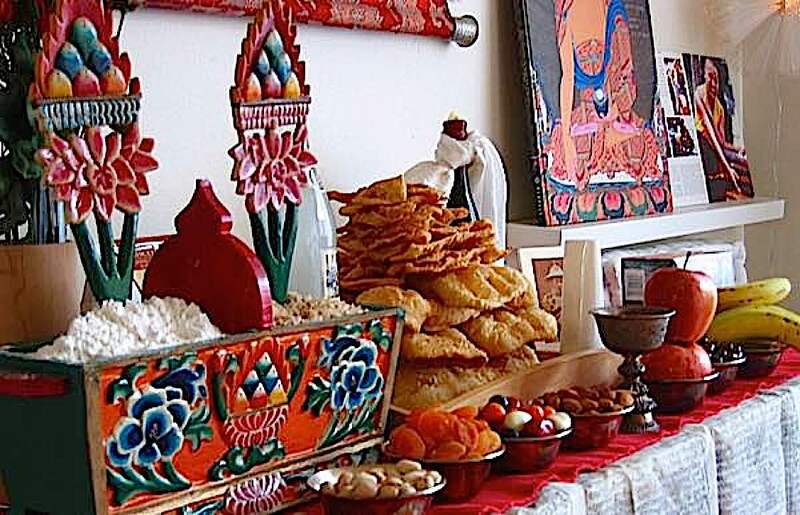 The first day of Losar is usually for family, the second day for friends and relatives. 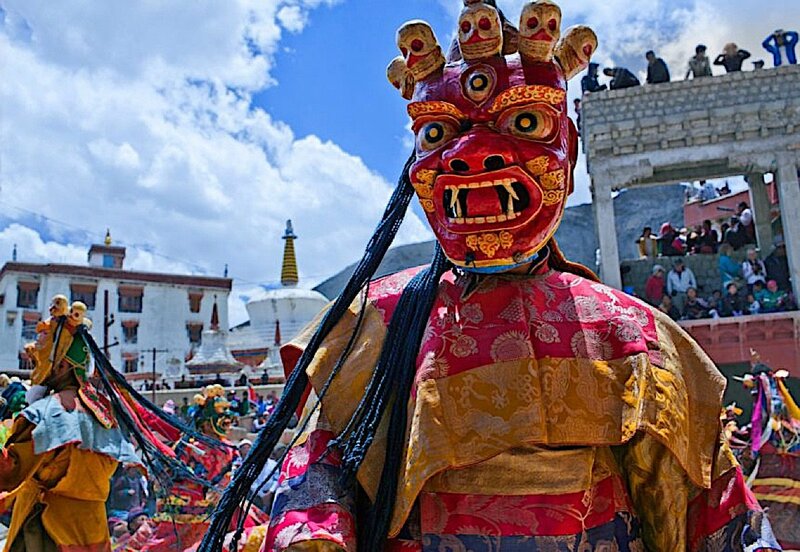 The third day is traditionally the day to visit gompas, monasteries and temples and make offerings. Offerings to the monks are important and meritorious. Offering prayer flags to the winds, to carry the merit to all beings, or turning prayer wheels with the same purpose are important merit.